In August 2016 Lucy Hefford (TDT Committee Member) visited Soroti to work with the Bible Translation Team in producing a children’s Bible. It was decided to do a pilot project with Mark’s gospel using illustrations by schoolchildren. In April 2017 Lucy again met with the translation team. In July 2017 Jim Sampson (TDT Chairman) met with Rev, Robert Ewangu to see the work which now included achildren’s Kumam Bible. 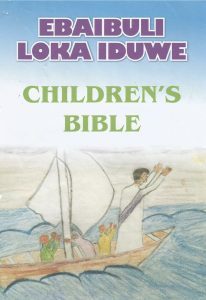 Both versions contain an English version of a Bible story alongside the Ateso or Kumam version. This trial version has now been printed and the team are now working on printing the whole book of Mark.